Dubai: The combination of milk from the UAE's dairy farms and cheesemaking expertise from Italy has resulted in locally made Italian cheese becoming available in the UAE for the first time. Buying freshly made mozzarella, ricotta and other cheeses will help you cut the carbon footprint of your shopping list and support the growing "Made in UAE" food market, rather than opting for imported versions filling supermarket shelves. Around 3,000 litres of raw milk from Al Ain dairy farms are delivered daily to Italian Dairy Products, an almost inconspicuous factory at Hamriya Freezone in Sharjah, were it not for the large cow-face signage under its roof. Andrea Pelati, 36, manager of dairy production, and Alessandro Nicotra, 26, assistant manager of dairy production at Italian Dairy Products, are the only imports. Both of them hail from a shrinking pool of Italians who are dedicated to the skill of artisan cheesemaking. "It's not a job. It's a passion," Pelati, the first cheesemaker in his family, said. "It has to be a passion because it is a hard job. The conditions are hard, you have to get up early and work in either hot or cold conditions," he said. "I love the countryside and always wanted to do this. I love it. It's like wine or bread, artisans need to have a passion for what they do," Pelati said. Nicotra, meanwhile, grew up near a cheese farm and was hooked on cheesemaking at a young age. The milk is pasteurised at the factory, lactic cultures and enzymes are added to change the nature of the milk to cheese. Around 30 per cent of the cheese is handmade and the rest is machine processed. A thousand litres of milk produces around 140kg of cheese. 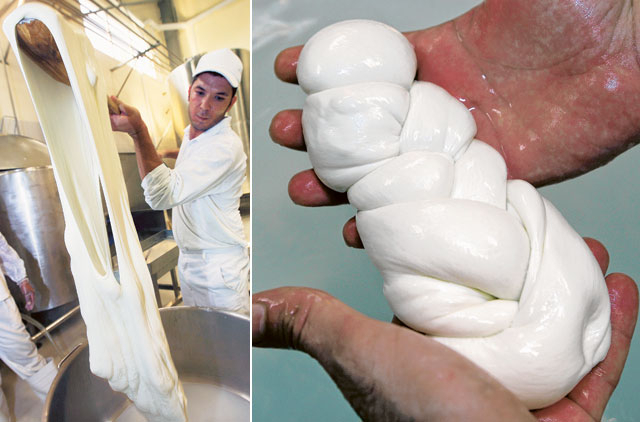 The mozzarellas and other varieties of cheese have an eight-day shelf life. Due to this extreme freshness, production is made to order mainly for hotels and caterers. The factory, though growing in popularity since the opening in April this year, is neither ready nor keen to start mass production for supermarkets, said Maria Luisa Panzica La Manna, manager of Italian Dairy Products. Instead the dairy company will be selling its products at the Farmer's Market held every Saturday by Ripe at the Dubai Garden Centre. "The whole point for us is to provide a fresh product from Italy locally," La Manna said. "We have a lot of private customers which are growing day by day. Our cheese is totally natural with no preservatives.We are just not interested in retail for now." Company owners Leo Condemi and Silvia Angelotti, Milan-based Italian cheese lovers, had the idea to set up the factory while on a holiday in 2008. No matter how far archaeological finds go, there is evidence that cheese came into being in prehistoric times. Cheese can not really be said to have been "invented". This delicious food must have resulted from the simple observation that milk left in a container ends up by coagulating, even more if it is hot. People living in areas where the climate changed seasonally would also have noticed the effect of temperature on this process: in warmer weather the milk would curdle faster than in the cold. This might be considered the first technological cheesemaking discovery. There are hundreds of different types of cheese that can be differentiated both by the type of milk - raw, skimmed or pasteurised, and by the animal - cow, goat, sheep, buffalo, horse or camel. Unpasteurised cheese with a range of flavours should not be sliced until purchase otherwise it will start to lose its subtlety and aroma. Keep the cheese in conditions in which it matures. Hard, semi-hard and semi-soft cheeses are stored in the temperatures from around 8 - 13 C.
Keep the cheese wrapped in the waxed paper and place it in a loose-fitting food-bag not to lose humidity and maintain the circulation of air. Wrap blue cheeses all over as mould spores spread readily not only to other cheeses but also to everything near. Chilled cheeses should be taken out of the refrigerator one and a half or two hours before serving. Cheeses contain living organisms that must not be cut off from air, yet it is important not to let a cheese dry out. Do not store cheese with other strong-smelling foods. As a cheese breathes it will absorb other aromas and may spoil. Wrap soft cheeses loosely. Use waxed or greaseproof paper rather than cling film. Let cold cheese warm up for about half an hour before eating to allow the flavour and aroma to develop. No matter how far archaeological finds go, there is evidence that cheese came into being in prehistoric times. Cheese can not really be said to have been "invented". This delicious food must have resulted from the simple observation that milk left in a container ends up coagulating, even more if it is hot. People living in areas where the climate changes seasonally would also have noticed the effect of temperature on this process: in warmer weather, the milk would curdle faster than in cold environments. This might be considered the first technological cheesemaking discovery. There are hundreds of types of cheese that can be differentiated both by the type of milk - raw, skimmed or pasteurised, and by the animal - cow, goat, sheep, buffalo, horse or camel. Unpasteurised cheese with a range of flavours should not be sliced until purchase, otherwise it will start to lose its subtlety and aroma. Keep cheese in conditions in which it matures. Hard, semi-hard and semi-soft cheeses are stored in the temperatures from around 8 to 13C. Keep cheese wrapped in wax paper and place it in a loose-fitting food bag so as not to lose humidity and maintain air circulation. Wrap blue cheese all over as mould spores spread easily. Chilled cheese should be taken out of the refrigerator one and a half to two hours before serving. Cheese contains living organisms that must not be cut off from air, yet it is important not to let a cheese dry out. Do not store cheese with other strong-smelling food. Cheese will absorb other aromas and may spoil. Loosely wrap soft cheese. Use waxed or greaseproof paper rather than cling film.